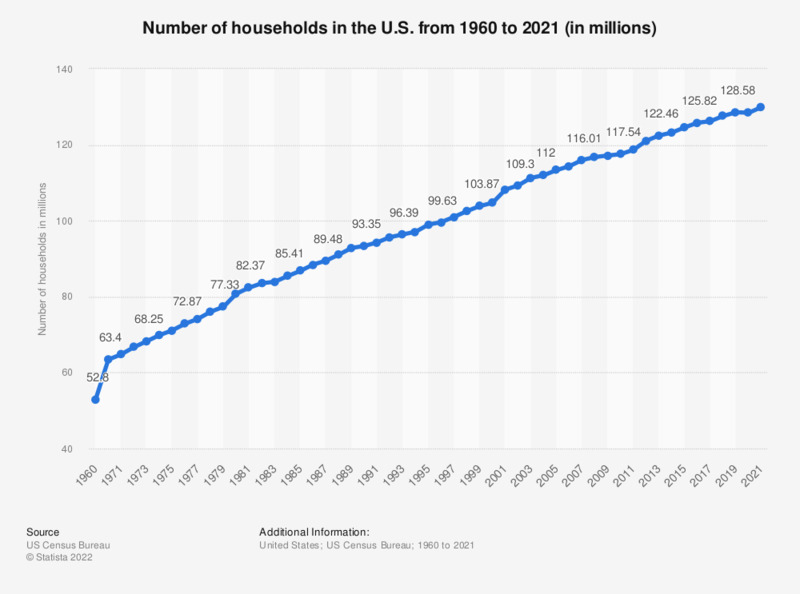 This graph shows the number of households in the United States from 1960 to 2018. In 2018, there were about 127.59 million households in the United States. According to the U.S. Census Bureau, a household consists of all the people who occupy a housing unit. A house, an apartment or other group of rooms, or a single room, is regarded as a housing unit when it is occupied or intended for occupancy as separate living quarters. A household includes the related family members, as well as all the unrelated people who share the housing unit. A person living alone in a housing unit, or a group of unrelated people sharing a housing unit, such as partners or roommates, are also counted as households. The count of households excludes group quarters. There two major categories of households are family and nonfamily. The number of households in the U.S. has been growing steadily over the past decades, as has the population. The total number of households has doubled from about 63 million in 1970 to more than 127 million in 2018. During the same period, the total population has increased by 100 million people (about 50 percent growth). Conversely, data on the average size of U.S. households shows that households tend to be getting smaller. In 2018, the average household size stood at 2.53 persons per unit, down from 3.14 in 1970. The distribution of households by household size has shifted as well over the years. One person households have increased from 17 percent of households in 1970 to 28.01 percent of households to 2018. On the other hand, the share of large households has decreased notably. Households larger than 5 members accounted for 21 percent of total households in 1970. In 2018, they accounted for less than 10 percent.